We had worked with Rob and James who's talents ensured Gumsaver got prototyped, manufactured and launched. They liked our design approach and hired us to design their website. It was paramount that the website of leading designers be smooth, simple and reliable across devices. Responsive design was yet to emerge but elements of this site were made on the same thinking and grid system which makes sites consistent across devices. 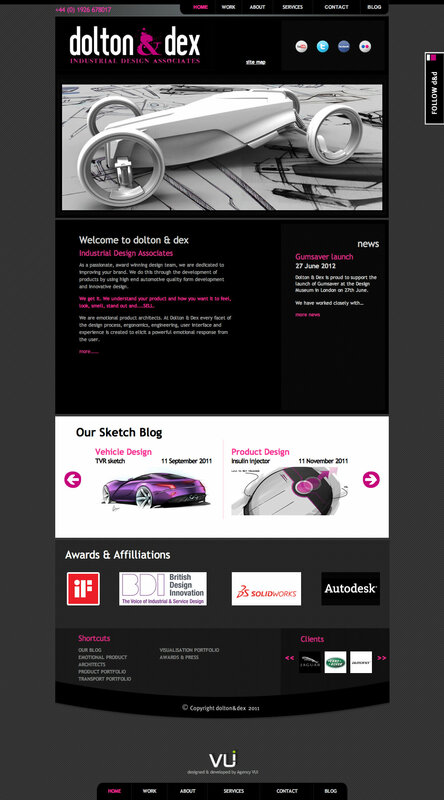 The Dolton and Dex site was designed to have a more narrow grid 833px than the usual 960 grid system. This ensured it was pretty flawless, pixel perfect & looked great and were easy to use on your iphone, ipad, whichever way you turned your screen. Even the dropdown navigation buttons were made finger friendly. Having built a solid understanding of their core services and strengths the site navigation and content was designed to get users where they needed to be quickly and thoughtlessly. Go on, try something different today, call us now. 18-22 Clemens Street, Leamington Spa, Warwickshire, West Midlands, CV31 2DL, UK.